You’ve never seen anything like this. Sure, the marketing for Stallone’s testosterone soaked movie The Expendables has been pretty spot on but tonight they’ve taken it to an entirely new level. Sly is no longer content simply to blow up other humans on screen for your amusement, he’s decided to start taking out some of his pent up aggression on the internet… by utterly destroying YouTube right before you eyes. This defies explanation. Suffice to say it’s one of the coolest things you’ll ever see. 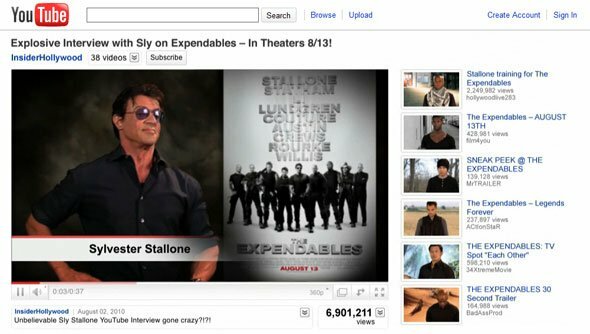 To watch rampant destruction of one of the most familiar websites on the planet, watch this entire Stallone interview right here or click on the image below. Watch it? You should seriously consider watching it again. This time, pay attention to what the guys in the other videos to the right of Stallone's video are doing. Best official movie promo ever? If so that makes the best unofficial promo this.